File Types: JPG; File Size: 1.07 MB; DPI: 300 DPI. - KATE MAXWELL STYLED PHOTOGRAPHY ? - STOCK PHOTOS READY FOR YOU TO DOWNLOAD! ЁC Just overlay your web design, graphic art, print, invitation, card, stationary, promo, headline, product shot, or use as is! Perfect for ONLINE SHOPS! - Buy 3 images & get your 4th FREE! Just enter code "4thfree" at checkout. - FOLLOW US on Facebook ( facebook.com/KateMaxwellPhotography) and Instagram (@katemaxshop) for a FREE IMAGE of your choice (& for ALERTS when we are having sales)! Just message us once you've followed us, let us know what image you want as our gift to you, and we'll send it your way! - Am I going to receive the actual items pictured? This is a digital product. Upon purchase, you will be able to download the accompanying file(s); no physical product will be delivered. - Are the images in your shop layered files? Only the "Style Your Own" category Styling Scenes and Prop Sets are layered files where the styling props appear on separate layers. Computer, Tablet, Smart Phone & Frame images have a Smart Layer positioned over the screen or frame opening to make inserting your print or screenshot easier. Upon purchase of these listings you will receive both a PSD file with a Smart Layer over the screen/frame opening, as well as a flat JPG file of the image. All other images are original, real styled photographs (rather than digital reproductions), so each styling prop is not in a separate layer. Upon purchase of these listings you will receive a flat JPG file of the image. - What are the image dimensions and resolution? Images are at least 3500 X 2329 pixels (many are larger) and 300 PPI (pixels per inch). So when used online at 72 PPI, the images can appear at least 48 inches wide if needed without losing resolution. - How many times can I use the image? Do I need to credit Kate Maxwell Photography? You may use the image as many times as you need to. You receive commercial and personal use rights when you purchase an image and may use the image an unlimited number of times online or in print, but may not transfer or sell them in any form to any third party. Kate Maxwell Photography retains the original copyright, but you do not need to give credit to Kate Maxwell Photography when using them. - Ready to improve the appearance & legitimacy of your online shop, blog, webpage, or profile? Tired of amateur photos making your products look wellЎ­ amateur? Step up your brand's image with PROFESSIONAL STYLING coupled with PROFESSIONAL PHOTOGRAPHY! - Ideal for WEB DESIGNERS, GRAPHIC ARTISTS, BLOGGERS, & ONLINE SHOP OWNERS! Every image is ready for you to download and customize. Whether you want to prettify a print, need a nifty shop banner, or want to advertise your latest promotion! - Every image is ready for INSTANT DOWNLOAD! Image files are high-resolution & 300 dpi. Downloaded file will not have watermark or "your print" text. - Just pick a handful of your favorite images and let the magic happen ЁC simply photoshop in the jpg or pdf of your prints or overlay some text! Then save as web-sized and upload! Make them yours, then show them off!! - Questions?! Comments?! Just send us a message!! 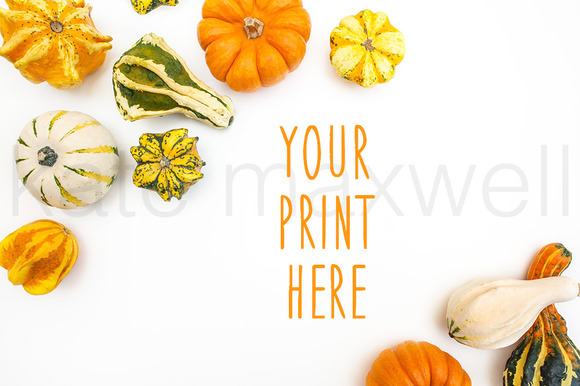 Keywords: fall styling, fall stock photo, styled stock photography, kate maxwell, katemaxshop, mini pumpkins, gourd photo..
Best ddsign template, vectors, illustrations, video templates from creative professional designers with After Effect, PhotoShop, 3DS Max, Cinema 4D or InDesign. Full details of CreativeMarket #466 KATE MAXWELL Styled Mockup 377189 for digital design and education. CreativeMarket #466 KATE MAXWELL Styled Mockup 377189 desigen style information or anything related.